The Blue Ridge Tunnel Foundation has partnered with some of the area’s best wineries, cideries and breweries to offer the first ever Hops & Headlamps tour on April 1 & 2. Comfortable shuttles will whisk you and your guests from one of our libation partners to the eastern trailhead of the tunnel. From there it is a flat, scenic walk (about 0.6 mile) to the tunnel entrance where you will be greeted by our knowledgeable historians to answer all your questions about this historical landmark. After you’ve explored the damp and shadowy tunnel, we will chauffeur you back to your chosen venue for tastings. Tours are on April 1 & 2 and will last approximately two hours, not including tastings after the tour. Departure times and tour sizes vary by location. Tour locations include Afton Mountain Vineyards, Basic City Brewery, Blue Mountain Brewery, Bold Rock Cidery, Cardinal Point Winery and Veritas Winery. The Hops & Headlamps experience is $32 per person and includes transportation, customized tunnel tour and tastings at the participating venues. Tours are expected to sell out quickly so register early! 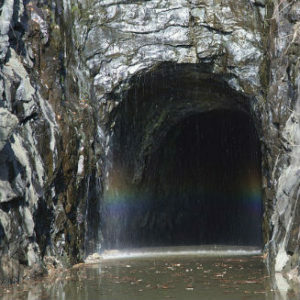 Register at www.blueridgetunnel.org. You can register a maximum of 4 people for each time slot. Tour is recommended for adults 21 and older; there is no discounted priced for anyone under 21. You must present proper ID and have your ticket at each venue in order to receive a tasting. Because this is a fundraising event, no refunds will be issued. For more information, call 434-263-7130.